HomeBusinessWhy Isn’t the Fed Doing More? Why Isn’t the Fed Doing More? David Leonhardt. Financial markets are fragile and the Fed does not want to upset the market’s confidence in the U.S. government by further easing of monetary policy. More monetary stimulus might just be the trigger to spook markets into dumping the dollar and U.S. debt. Daniel Gross: The Fed is exhausted from its grand experiments in central banking–it has already drop interest rates to 0%, created new lender-of-last-resort facilities, and blew up its balance sheet–and is puttering out from sheer exhaustion. Ryan Avent: There is division within the Fed on whether further monetary stimulus is really necessary. Moreover, even if there were no internal divisions, the Fed leadership may still be reluctant to act because it fears doing so may cause long-run inflation expectations to become unanchored. There may be some truth in these responses, but let me add two more potential reasons for the Fed’s inaction. First, the Fed may believe that some of the problems in the economy may be real in nature rather nominal and if so there is little monetary policy could do to improve matters. For example, if the Fed believes the high level of unemployment is mostly of the structural kind rather than cyclical then there is only a downside to further easing. This probably isn’t a big factor–see the Atlanta Fed and the Ryan Avent on this issue–in the Fed officials’ thinking but on the margin it may give them another reason to be reluctant to ease. Observers, however, like Michael Belongia, Scott Sumner, and Nick Rowe have been arguing for some time that a low federal funds rate can be a misleading indicator of the stance of monetary policy. Even if one sticks with the federal funds rate as an indicator, then folks like Glenn Rudebush would point out the it would need to be about -3% (which it can’t because it can’t below zero) to be adding the right amount of stimulus. The bottom line is that the Fed may be inadvertently tightening by sitting on a 0% interest rate target and doing nothing. 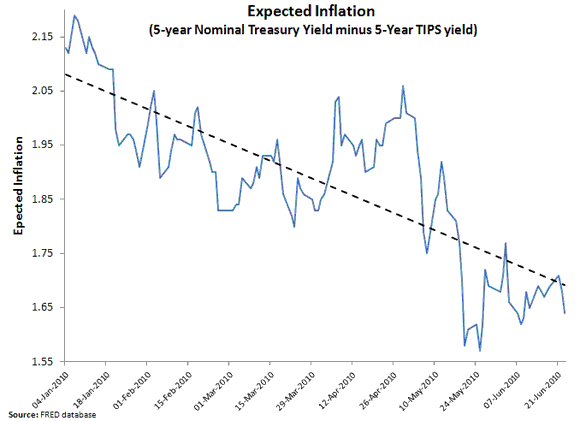 This unintended tightening of monetary policy seems to be the message coming from the difference between the nominal interest rate on the 5-year Treasury and the real interest rate on the 5-year Treasury inflation protected security (TIPS). This difference or spread amounts to the markets expectation of future inflation. Below, this spread is graphed for the first half of this year up through June 23, 2010. 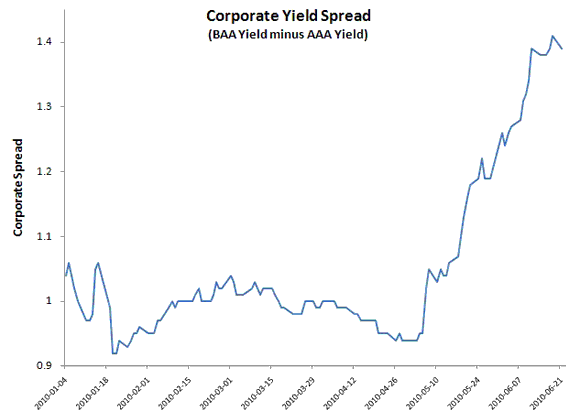 Second, even if spreads are driving the some of the more recent declines in expected inflation one must ask whether the spreads would be going up in the first place had the Fed been stabilizing inflation expectations (and thus aggregate demand) all along. Any way you slice the data it ain’t a pretty picture. So what do you think? Why isn’t the Fed doing more? Why Wasn’t the Recession Far Worse?